Início Log bonita em Whitewood, SD disponíveis o ano ao redor. Renunciar dos limites de um quarto de motel ou vários quartos de motel e desfrutar dos confortos de casa, enquanto viaja a bela Black Hills. Esta casa tem tudo que você precisa. A casa tem um deck superior com cadeiras e ventiladores de teto e convés inferior completa com churrasqueira e mesa de jantar ao ar livre. 3 quartos, todos com camas queen size. Em tamanho grande sofá-cama para dormir adicional. A planta em aberto inclui um café bar e sala de jantar. Grande cozinha adequado para vários cozinheiros. Existe uma sala de família / TV separado. A lavadora e secadora localizado no piso principal para sua conveniência. Aprecie a beleza e serenidade deste novo lar. À noite você pode assistir veados roaming nas pastagens próximas. Awesome experience!!! Planning on coming back! Dave and Barb were great hosts. Nice people and we’re a few minutes away if we had issues, which we didn’t. They were very accommodating, even asked if we need a Christmas tree put up. The cabin is beautiful and is setup perfectly. Enough room for everyone to have their own space. Outside was a awesome view of the hills. Seen deer everyday, even had some about 5 yards out the dining room window when eating supper one night. Dog and kids had room to play outside. Location was perfect. 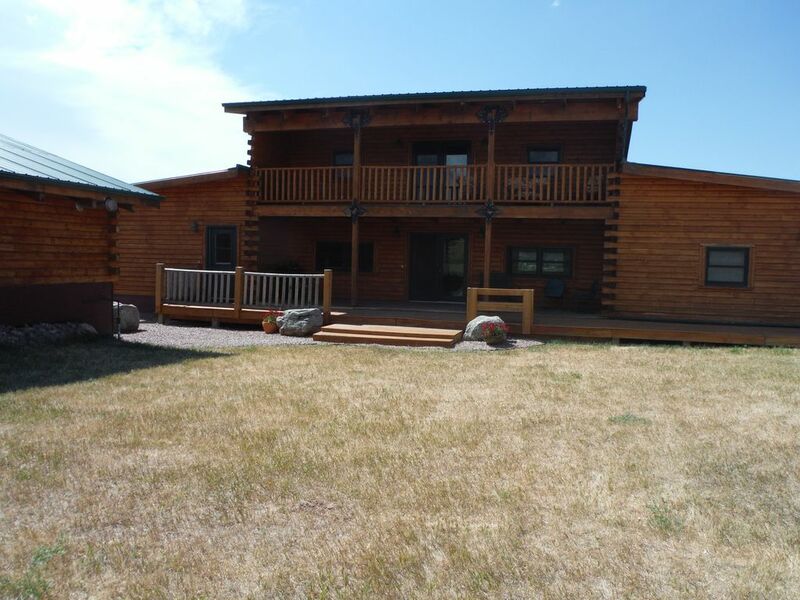 Easy to get to and quiet but only 15 minutes from Spearfish, Deadwood and Sturgis. Dave and Barb, thanks for the experience. We Will be back!!! We are happy everything worked out for your family. Look forward to hosting you again. Easy check in and out. Easy to get to. Owners close and easy to get along with. Newer beautiful house. No problems what so ever. Will stay again. Thanks Mike. Happy you enjoyed your stay. Really awesome house with plenty of room for everybody. Barb and Dave were great hosts, answered any questions we had, really nice people. I highly recommend this place. Thanks again!! We are happy you all had a good stay. Come back anytime. Great place to stay and see the area ! This was an awesome place to stay and be in the middle of the Black Hills ! It was easy to get to and very quiet. We loved watching the large deer every evening as well as in the early mornings. Everything ran smoothly and we had no issues. We had take out from Bullwackers that was very good. If we are back in the area we will stay again ! Enjoyed having you stay. Glad you got to experience Bullwackers. We love their food. Hope to see you again. The owners were very accommodating & felt that they would go out of their way to make us comfortable. Thanks to you and your family. We love this business and vacations are special times for people so we want it to be a great experience. Come back again. Awesome place to stay. Plenty of room and a great view. I would stay here again. We have 7 in our family and this was plenty of room for everyone. The owners are super nice and helpful. Great view and a nice quiet place to relax outside in the evenings. Thanks. We are happy you enjoyed your stay. You are welcome back anytime with your lovely family. A casa tem uma localização central no coração do Black Hills de SD. Você será capaz de desfrutar do Rally Sturgis a primeira semana de agosto. Desfrute da bela unidade através Deadwood para visitar Mount Rushmore Monumento Nacional e do Black Hills Southern incluindo Custer State Park. Siga para oeste por 10 minutos e você está na bela Spearfish Canyon. A deve ver no outono. Gaming mais ao seu gosto? Apenas a 10 minutos de distância é a histórica cidade de Deadwood. Home of Wild Bill Hickok e Calamity Jane. Os dias anuais de 76 não é para ser desperdiçada. Super Deadwood Noites tornou-se um dos maiores espetáculos de carro coletor em nossa área. Devils Tower, WY é apenas uma hora de distância. Prefiro ver o Monumento nacional do ermo? Fácil acesso de carro a partir desta casa de aluguel. Unidades de verão no Black Hills são espectaculares e há vários campos de golfe num raio de 20 milhas. O inverno oferece caça, esqui, snowboard e snowmobile todos dentro de 30 milhas. Contact us for groups larger than 8 for individual consideration. The booking deposit required to hold dates. We accept personal checks and HomeAway payments.